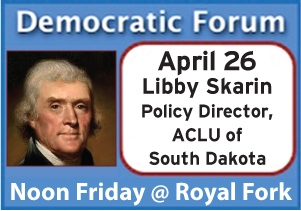 The Sioux Falls Democratic Forum invited Elizabeth Skarin to talk about Voter Rights, Political Rights and what to consider when electing officials including the Attorney General of South Dakota. This Friday noon presentation was at the Royal Fork temporary location on July 20, 2018. 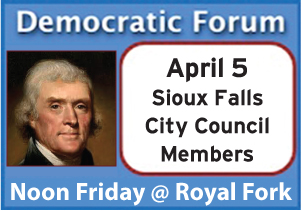 SPECIAL NOTE: Due to the daytime closing of the VFW, Democratic Forum will be held June 22 and 29 at the ROYAL FORK buffet on 49th Street south of the Empire Mall. Our special rate for the full buffet, including beverage, will be $9.50. Members need not purchase the buffet to attend the meeting but that will be the only option to eat. The buffet includes a wide choice of entrees, sides, salads and desserts. 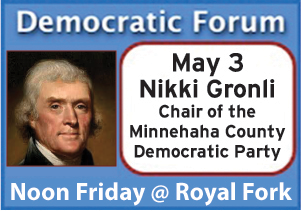 Be sure to mention you are with Democratic Forum when paying. The buffet opens at 11:00 and early arrival is encouraged to avoid long lines. 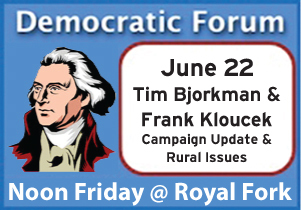 Tim will provide a short update on his campaign while Frank, an active farmer, will discuss rural issues in SD. 4610 W Empire Place. Opens at 11:00 AM. July 6: FORUM: Jana Johnson on Haiti. The problem is they don’t know yet. 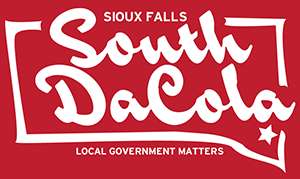 They were informed this morning that the VFW will no longer be open during lunch hours starting immediately. Forum has been held at the VFW on Fridays at Noon for a very long time. They are searching for a new home, until than they hope to find a temporary place for the next couple of weeks. Stay tuned for updates. 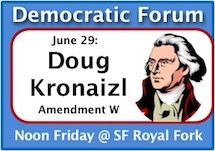 The speaker arrangement will change tomorrow at Forum. Due to a family emergency Rose Grant will not be able to attend. 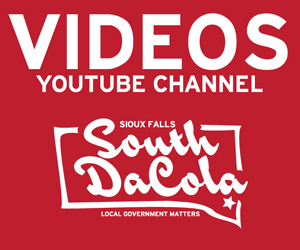 Cory Heidelberger will speak in her place, and Jeff Barth will remain on the docket also.